As Erica reported yesterday over at Publicola, the whisper campaign regarding Seattle City Attorney candidate Pete Holmes is no longer a whisper, with both incumbent Tom Carr and his campaign manager Cindi Laws now publicly and repeatedly challenging Holmes’ eligibility for the office. The City Attorney shall be an attorney of the Supreme Court of the State, and have been in the practice of his or her profession in The City of Seattle for at least four years next prior to his or her election. My Washington bar license has always been on “active” status. After 16 years in the private sector, City Council appointed me as the lawyer member of the OPA Review Board in 2002 (which expressly requires a WSBA member in good standing), where I practiced my profession in public service until the last quarter of 2008. I’ve been in private practice at Crocker Kuno PLLC since the first quarter of 2009. I was fully authorized to practice law during my OPARB tenure; I just didn’t accept private, fee-paying clients—and presumably Carr hasn’t either since 2002. Now, I’m no attorney (much to my mother’s chagrin), but I don’t read anything in the City Charter that says anything about taking on private clients. 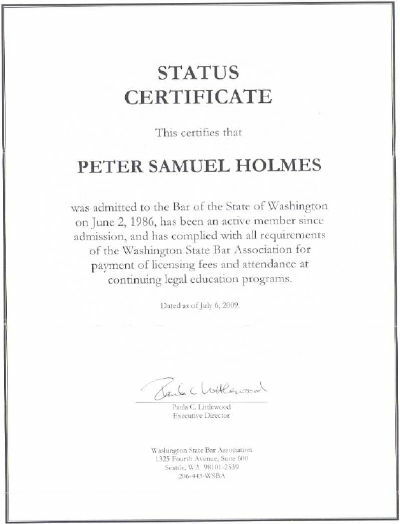 If Holmes has been an active member of the Bar, and such membership was a requirement of his appointment to the OPA Review Board, then that sure sounds like practicing law to me, for why require an active attorney if not to benefit from his legal advice? And how, in this sense, is Holmes legal service to the city really any different from Carr’s legal service, except by volume? But all this niggling, legalist nitpicking is really beside the point, for if Carr truly believed that Holmes was technically ineligible to run for the office of City Attorney, the appropriate course of action would have been not a whisper campaign, but rather a legal challenge to his eligibility under RCW 29A.68.011, alleging that Holmes’ name “is about to be wrongfully placed upon the ballots,” and to be filed in King County Superior Court “no later than the second Friday following the closing of the filing period for nominations for such office“… a deadline long since passed. I mean, Carr is the sitting City Attorney for chrisakes. I assume he knows this stuff. No, instead Carr and Laws appear to be raising questions about Holmes’ technical qualifications merely as an underhanded means of raising questions about Holmes’ professional qualifications for the office. “Hey look… this guy is such a crappy lawyer he doesn’t understand the law enough to realize he isn’t even eligible to run for the office!” That seems to be the message coming out of the Carr campaign. What this sort of cynical, political maneuvering says about Carr’s own professionalism, I’ll leave up to you. Are you sure Carr and the Crack Piper aren’t the same person? Just wonderin’. I’ve seen Tom Carr. He doesn’t wear a kilt. Tom Carr and Cindi Laws are making this an easy choice, aren’t they? I support Tom Carr, and it’s a no-brainer. Holmes has not made any case whatever that he is the better candidate, and none of his supporters have made it for him. “Throw the bums out” is mostly what it amounts to. @5 Hell’s bells….with Democrats like this, nobody’s going to miss the Republicans. OMG! We agree on something! OMG! Even a blind pig finds an acorn once in a while. Enjoy your acorn. Ineligibility to vote for either Tom Carr or Pete Holmes. Not that that precludes either of you from supporting one or the other, of course. Nice to have your permission to support Tom Carr. Piper Scott endorses Tom Carr. Carr’s behavior (and that of his surrogates) as a candidate has been nothing less than vicious and useless to voters. Holmes’ behavior has been gracious and aimed at issues rather than character assassination. I made my choices over access to public records and poor use of police resources. With Democrats like Carr and Laws, we don’t even need Republicans. The “practice of law” is a fairly broad concept. “Taking on clients” is not a necessary component of practicing law. Judges, for instance, have no clients, but I don’t think a fair argument could be made that they don’t practice law. Seems to me, from my most humble of perspectives, that Holmes meets the criteria. City Attorney’s DEBATE on Sept 24. Shouldn’t somebody mention that Laws worked for the Holmes campaign first? She left the campaign to go work for Carr. $7,500 from the Holmes campaign — albeit while he was running for city council. I wanna know this story! Goldy, help a brother out. What does the City Attorney have to do with the use of “police resources”? 2nd- Where did you get your expertise in this matter? I thought so. I rest my case. Tom Carr was on the strategic task force behind the planning of “Operation Sobering Thought”. By any measure, this was a waste of police resources. If you thought the whole operation was a bad idea, then the operation wasted $52,000 in police time and resources with an unknown amount of resources from the City Attorney’s Office. This figure is unknown because when you try and find out how much resources was put into the operation by the City Attorney’s Office, they can’t even tell you which attorneys worked the 26 charges filed. Now, if you thought the operation was a good idea, he still wasted police effort and resources because they didn’t get one conviction or guilty plea out of 26 charges filed. Expertise comes from actually looking into the real issues. Sobering Thought is one of those issues. The city attorney guides our entire arrest and prosecution strategy. Period. Therefore is responsible for our prosecutorial budget. Since misdemeanors cost us 60K PLUS after arrest programs, this is important. Upwards to 35% of our budget goes for misdemeanors. If the City Attorney says “don’t bring me financial fraud cases under 10k” then that’s the deal. It’s completely legitimate to question use of police resources and prosecutorial budget. Just like after I-75 passed, the arrests went down, but prosecutions went up. Go figure, the police got it, but Carr refused to follow the law or the voters. True story: Tom Carr’s office prosecuted me for obstruction because I refused an officer’s order to produce ID. Except that, oh, wait, that’s not even a crime in Washington. So after dragging me through three preliminary hearings before Seattle Muni, they dropped the charge on the day that the first contested hearing was scheduled to commence. Eric (@21) needs to be paid attention to. What he went through is a perfect example of Tom Carr’s behavior in office. We could go on and on about it, but Carr has squandered our money pursuing prosecutions and engaging in behavior that Seattleites don’t support. The polls and votes show it. Carr can’t let go of bad ideas, and then spends millions to pursue them. I’ve been supporting Pete Holmes, because I have followed his work on the OPB, and it’s entirely clear in a microcosm there what he stands for–and what Carr doesn’t. Transparency. Sense. Accountability. Sounds like slogans, but Holmes fought for years to be able to let citizens know what police who violated their obligations actually did–and which police did. The police union has city hall and Carr apparently so cowed or coopted that Carr won’t fight like Holmes did to open the doors. Without accountability and transparency, we are continuing to see officers act with impunity because there’s no way they will ever receive any punishment for acting outside their guidelines or the law. Or that punishment will be far off, reduced, and they’ll keep their pension, while no one will ever know what they did. I’m not anti-cop. I’m against a set of behaviors that coddles the worst of the police, while giving no incentives for the rest of them, the majority of them. Sure, this is one issue, but if you look at major and minor events in Seattle, a lot of them swirl around the police, the city’s control of them, and what happens afterwards. The transparency issue is HUGE in this race. The sunset commission has grown to 300 execptions since it’s inception. Used to have 9 or 10. Carr hasn’t repealed a single one. Hangartner is just a travesty. Cops are safer with oversight, as is the public AND it’s cheaper for the city. Excessive force cases are expensive! Something like a 150K payout on average, PLUS the legal time and other expenses. The One Best Way to drive down health care costs? Goldy and what’s-his-name said it best: Kill the lawyers. Except Piper, Bork, Scalia, Alito, John Roberts, the Federalist Society, and the Rutherford people. “Your comment is awaiting moderation”: Eagerly awaiting your immoderation. Knock yourselves out. Time for registrations, background checks, and waiting periods?